Fun times with my son on his free ascent of the Nose. 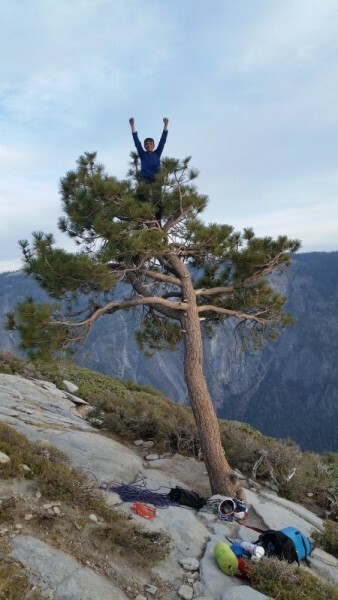 Jim Herson is a climber from Emerald Hills, CA. it feels like I am time traveling....might just be the aging thing, hahaha! I really liked the tears shed because the partners could not climb the cruxes with one another. So like Tommy and Kevin on the Dawn Wall push. So good! Thanks for the share. I remember reading about this here and thinking how great it was...but seeing the pictures is even better because your son looks so, well...15!! Truly, Truly an amazing accomplishment. Congratulations to you both. And maybe the best climbing article ever. What a great talent for story telling and for conveyance. Thanks so much, what a great inspiration to see what is possible. Oh man, so awesome!!!!! You should quit your job and just write. Still remember reading your half a Half Dome day in winter with Kara post in a room with every child welfare director in the State of California. That one really made my day. LOL. You guys set the highest standard of coolness and wildness. Go wild and take chances bro. PS...don't think I ever told Anne, but she was the only climbing buddy who reached out to me as I was struggling through the crisis of the children who were murdered in my community. That meant so much to me!!!! You guys really are the best in so many ways. This is an absolutely amazing TR. I can feel the joy and proud dad vibes throughout, but especially during the Changing Corners video. Loved watching Connor's footwork on that pitch. Mazal Tov to Connor and Mom and Dad. That was simply incredible in so many ways. You must be one hell of a teacher, and obviously a model dad. Glad I did the Nose in 1971. No crowds then! What a future both your kids have due to great parenting. This is the best thing I have read about climbing in a long time. Jim, your writing is so heartfelt and spot on, I hope you publish more of your amazing stories someday. I cannot imagine the joy you experienced sharing this with your family and the despair following the devastating loss of your friend Tim Klein. Your line about parenting, "The challenge of parenting is to nurture the innocent wonderment while shutting down that delusional nonsense." is pure gold! Thank you so much for this amazing tale. Bravo. That was the most engaging piece of climbing writing I have read in years! Jim--an excellent tale phenomenally well told, with stellar photos to match. Thank you both for making my day. You're lucky to have such awesome kids, and they are lucky to have you! WOW again. just read the whole thing and it brought tears.. So sorry about your friends. Congrats to Connor, but I had no idea there was an age limit. Congrats kid. Amazing achievement and you have a rad dad for investing in you so well. Yay for parents who love their kids enough to guide them through life through the lens of outdoor adventure. Well done Jim and Anne. Other than the core shot and the support of sport climbing in general. That was pretty bad parenting overall. Way to get after it pops and young'n. Wow! Fantastic job...really nice talking to you and Connor at tge AAC banquet. Quite an accomplishment- more to come, I'm sure! Some sadness there with proper family levity. By the way, anyone want a pair of jammies cheap? Outstanding! Loved the videos. So much more mank on the great roof pitch than there was 25 years ago. Spectacular. Cut those ropes down. I cut webbing globs off belay anchors in the Gunks regularly and the local 'guides' (I use that term tinged with hate) get pissy because they use these as TR anchors for their clients. F-them. I probably saved a life just becasue the rat nest of slings hid pitons with cracks through the eyes. Guides, indeed. What an incredible family dynamic- mind blowing accomplishment. Wonderful attitude and stoke- Thanks for sharing- and to paraphrase Stevie Wonder: Writer- keep on writing! This is so much fun to read about. Connor is an accomplished long distance runner, and when it was mentioned that at one point, he was running cross country 5-6 days a week, but not climbing much, it got me to thinking about distance running as a complementary pursuit to climbing. The running certainly gives him extra endurance for a long free climb, and so I can see it being a help for that kind of a climb. Most marathon runners have fairly spindly arms, but they tend to be very light in weight, and so start out with a good strength to weight ratio. Sounds to me like, reading between the lines, that both Honnold and Caldwell were impressed with how easily he was able to do it. In his younger days, Warren Harding was said to be able to hike to the top of Half Dome faster than anyone else, so that kind of long distance endurance seems to be part of the mix. Brilliantly written. Thanks for such a fun read. Remember when getting your drivers license at 16 was so important? Kids these days... Oh, and my favorite part was the irony of Connor having to make up missing PE points! D'Oh! Another wonderfully written story from you! Reading this was way better entertainment value than most of the movies I pay to see. Great footwork on the Great Roof Connor!